Police officers in Swaziland are being prepared so they can go into schools and invigilate exams if teachers who are campaigning for a pay rise refuse to do the job. More than 500 police officers are being trained, a report in the Observer on Saturday newspaper in Swaziland reported (29 September 2018). Training has taken place at the Police Academy in Matsapha. Members of the Swaziland National Association of teachers (SNAT) are seeking a 6.55 per cent cost of living pay rise, but the government has offered zero. The industrial Court in Swaziland (recently renamed Eswatini by absolute monarch King Mswati III) forced SNAT to postpone a three-day strike due to start on 25 September 2018. SNAT has since said its members will attend school but will not work normally. 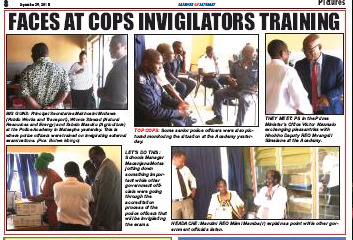 The Observer reported, ‘A visit by the Observer on Saturday team to the institution uncovered government officials from the Ministry of Education and Training and other ministries training over 500 police officers in readiness for the examinations on Monday. The police denied training was taking place, but the Observer published photographs it said showed police officers undergoing training at the college.